One of our favourite wedding looks is the layered bridal comb and wedding veil. It’s a modern take on the traditional bridal comb or hair pins nestled into the side of the bun. It’s sophisticated and chic, and creates a mood of regality without wearing a tiara or crown. The bridal comb is a great option for brides wanting to add a little something to their hair. They are subtle in their beauty, while completing your look – whether it’s boho, vintage, luxe, or understated glamour. If you have a veil with some bustle, choose a more elaborate bridal comb. When this look is styled correctly, it is simply breathtaking. Unfortunately, not all combs and veils can be styled together. Your headpiece or comb needs to be designed specifically for this purpose. 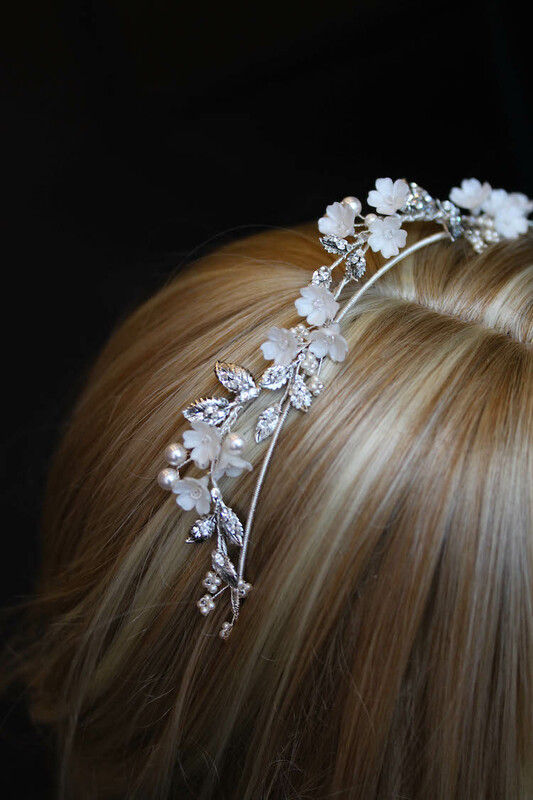 We have designed many styles in our wedding headpiece collection to achieve this look. Over the years it has become the signature look of our brand. If there’s a piece you love from a collection but you aren’t sure if it will work with a veil, get in touch. We’d love to offer advice and recommendations. To achieve the layered look, it’s important to think proportions, spacing and your hairstyle. The goal is to create a look where the headpiece and veil appear as one and pair seamlessly together. Here are our tips on creating the picture perfect bridal comb and veil layered look. When choosing your bridal comb, consider its proportion relative to your veil’s comb. After all, they’ll need to be slotted into each other (think big spoon, little spoon). The body of your bridal comb should be wider (longer) than the width of your veil’s comb. Your headpiece should sit flush with your veil, ideally overlapping it. So if your veil’s comb is 3 inches long, your headpiece needs to be at least 4-5 inches long. 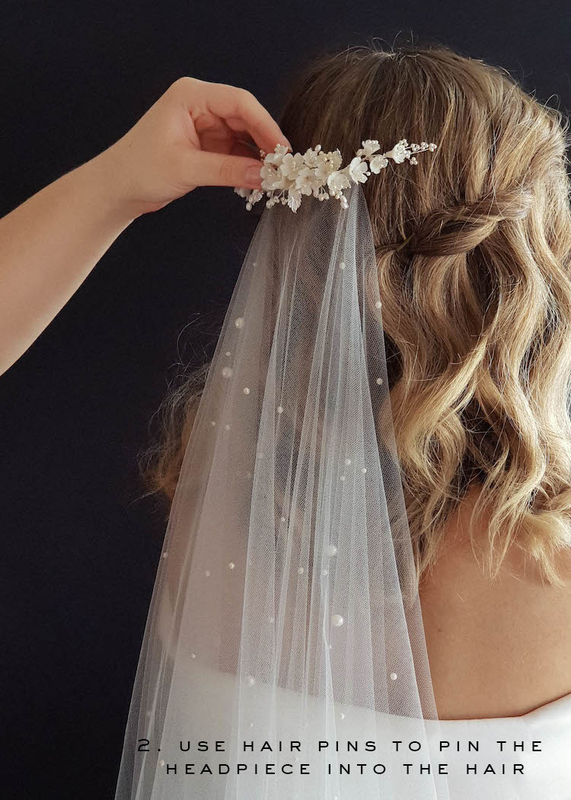 If you’re thinking of a small delicate comb with a full veil with blusher, it’s important to consider whether the headpiece is wide enough (and full/detailed enough) to cover the veil’s comb. Some veils are made on thick plastic combs with a lot of tulle wrapping – these veils are hard to work with because they appear heavy and chunky. All of our wedding veils are made on fine metal hair combs – they’re strong and sturdy, but also flexible and lightweight. Do you you prefer a fuller, gathered veil over a drop veil? If so, not a problem. Just ensure your headpiece is larger enough to cover the veil’s comb. The VERSE hair comb is a smaller comb that pairs perfectly with a fuller AMORA wedding veil with blusher. If you prefer a delicate look, we suggest a sheer drop veil, like our Rosella chapel veil or the Blair fingertip veil. Our drop veils sit flatter and will ensure your bridal comb will stand out and frame your hairstyle. The layered look of a headpiece and veil adds the perfect touch to a classic silhouette. For a more delicate look, choose a drop veil so the material sits flatter against your bridal comb and showcases your updo. A smaller hair comb looks just as beautiful with a fuller veil. Your bridal comb should be greater than the width of your wedding veil. When styling your wedding comb and veil, make sure you take into account how they’re constructed. If you have two central combs (one on the veil and one in the middle of the headpiece), it will be possible to layer them one of top of the other but it may be more of a headache – literally – than it’s worth. Look for headpieces designed around a split comb system or headpieces which doesn’t feature a comb at all. This way you can easily position the veil, position the headpiece and easily pin them into place. The two comb system is signature to our brand – we feel two combs allows extra flexibility with style around various hairstyles and head shapes. And of equal importance, it means you can style your headpiece with a veil. Just ensure the combs are wide enough to sit either side of the veil’s comb. For some styles, no comb at all works well too. Personal preference and we’d be happy to offer advice and recommendations based on your hairstyle and hair type. The more accessories you have in your hair, the greater the base that is needed to support them. We suggest the layered look is best suited for an updo, but a half-up half-down hairstyle can be achieved using a few simple techniques to secure those metal hair combs. We don’t recommend the layered look if you are wearing your hair all down. Unless of course your hairstylist has cleverly hidden a foundation under the hair to support the piece in your hair and has taken extra precautions (extra hair pins!) to secure the headpiece or veil into place. Check our blog post with tips on how to secure a metal hair comb, including on all out hair hairstyles. Once the veil is secured into place with bobby pins, you’re now ready to position the headpiece and pin it into place. Best to secure the veil first and then the headpiece on top of the veil’s comb for a more seamless finish. Sometimes you just love a particular headpiece, but it’s either too small for your veil or set on a central comb. Or, you may want to wear your mum or sister’s veil but aren’t sure whether our headpieces would suit. Fear not, the good news is, we are here to help. All our pieces can be customised and modified to suit you. Chat to our team today on how we can help you create your ultimate bridal look.